Many improvements have been made to the new version of Virtualbox 5.2. One of the most important feature is the ability to export our VM to Oracle Cloud system. And off course there are many other improvements and bug fixes. This article will guide you how to install Virtualbox 5.2 on Ubuntu 17.10 Artful Aardvark. The new Virtualbox 5.2 supports Ubuntu 17.10 and works pretty well on my computer. Virtualbox is a free virtualization software which allows us to run multiple operating systems on a single host. We can run Windows, Linux distribution on a single machine. Each OS will have a separated virtual hardware and network. So it won’t affect your host or other virtual machines. To install Virtualbox 5.2 on Ubuntu 17.10 system, please follow these steps. We need to install some packages before installing Virtualbox. 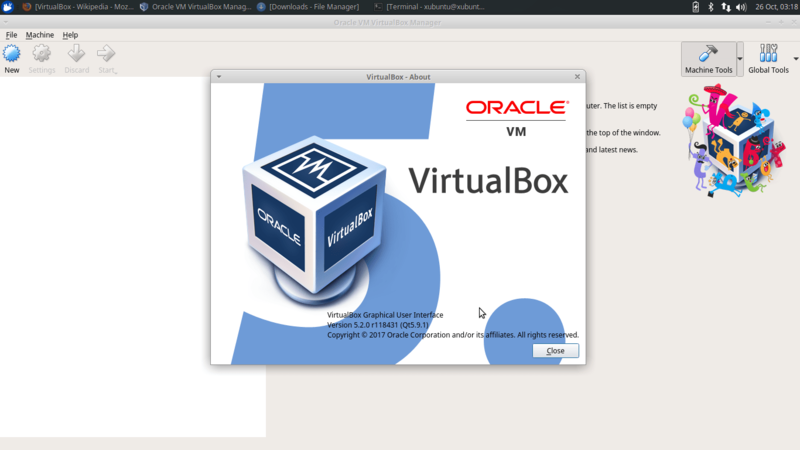 This tutorial to install Virtualbox 5.2 has been tested at our labs. But we do not guarantee that this will also works on your hardware configuration. Please leave us comments if you have any queries.